Eduardo Ortega's month was a good one. In 25 games in July 1989 for the short-season Batavia Clippers, Ortega hit .365, according to The Philadelphia Daily News. He also amassed an 18-game hitting streak. For his efforts, Ortega won the Phillies organization's minor league player of the month honors, The Daily News wrote. For Ortega, though, it was an honor that wouldn't last. He ended up playing just two seasons in the Phillies organization and four more in independent ball, marking the extent of his career. 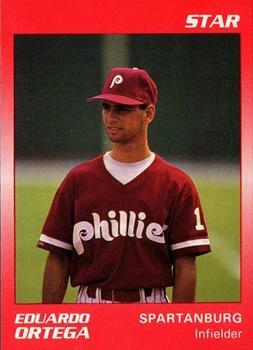 Ortega's career began in late 1988, signed by the Phillies as an undrafted free agent out. The Daily News has him from Puerto Rico. ProCards has him from Venezuela. Ortega started on the field in 1989, as an 18-year-old, at Batavia. After that stellar month in July, Ortega finished out the year with with a .284 average. Ortega moved up to single-A Spartanburg for 1990, playing the season there. In an early April game, Ortega singled and scored in a loss. He also had two RBI in a June game. Ortega, though, couldn't get the traction he had at Batavia. On the year at Spartanburg, Ortega hit just .237. By October, Ortega got his unconditional release. Ortega continued playing for four more years in independent ball, but he never made it back to affiliated ball. Ortega played 37 games for independent Salt Lake City of the Pioneer League in 1991 and 26 games back there for 1992. He hit .382 his first stint there, but just .191 his second. Ortega then finished out his career in 1993 and 1994, spending both years at independent St. Paul, of the Northern League. He hit .286 his first year, and .274 in his final year in pro ball.